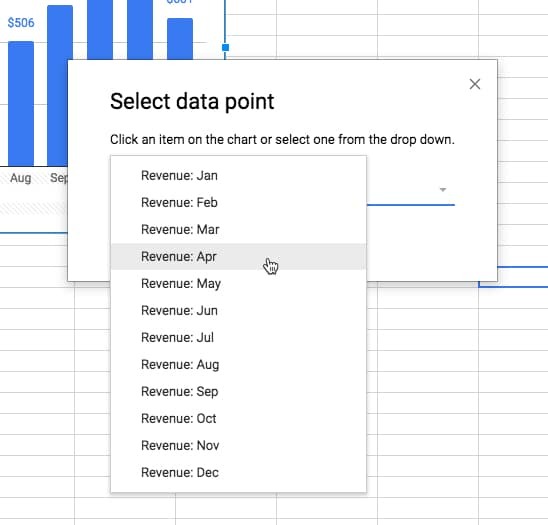 How can I format individual data points in Google Sheets charts? 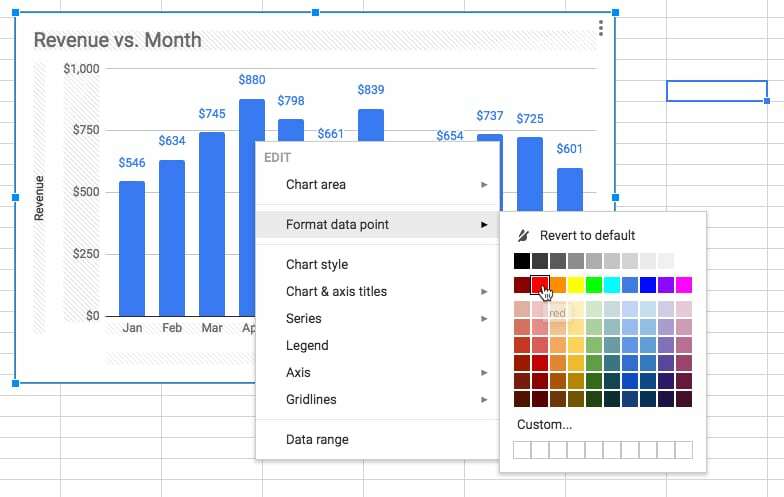 In this article, you’ll see how to annotate your Google charts, by adding formatting and data labels to specific data points only. Formatting specific datapoints or adding data labels are a very powerful way of adding context to your charts, to bring attention to certain data points and add additional explanation. How to add formatting to individual data points only? How to add labels to specific data points only? 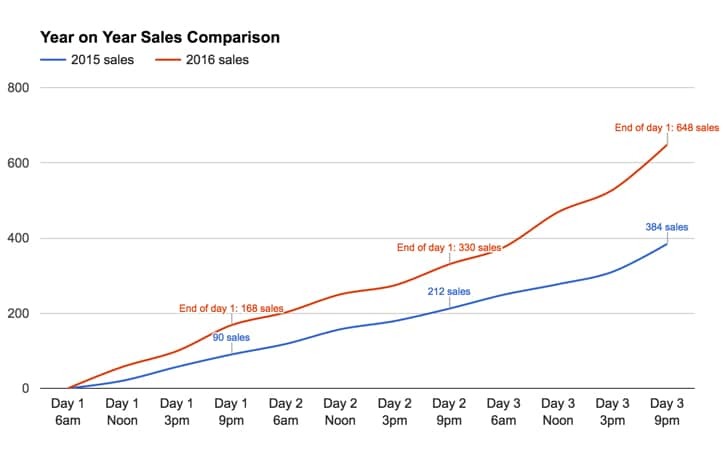 In the example below, I used data labels to clearly indicate the sales figures for the end of each day, during a 3-day digital flash sale, which helped the client easily see their performance. 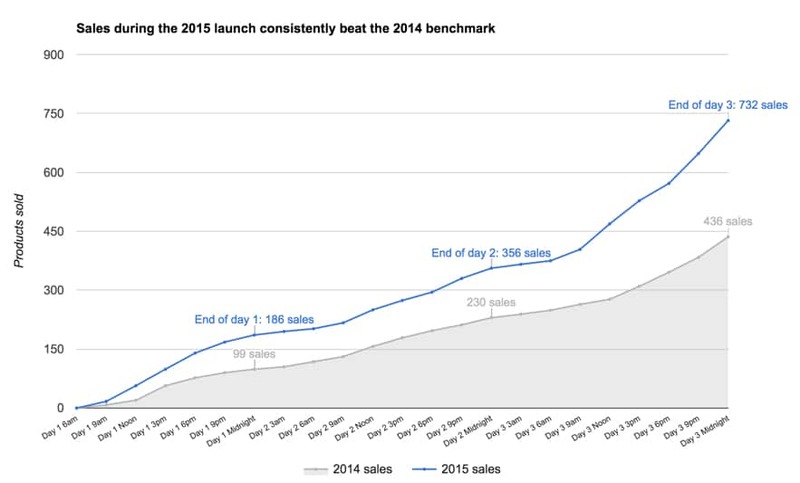 which records the number of products sold during a 3-day sale. So, we need an alternate approach. The trick is to create annotation columns in the dataset that only contain the data labels we want, and then get the chart tool to plot these on our chart. ="End of day 1: "&D5&" sales"
Can I see an example worksheet? 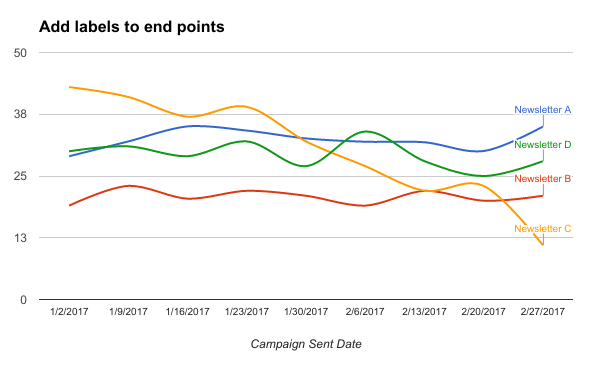 How do I add data labels to only the last datapoint of my series in Google Sheets? Using exactly the same technique as illustrated above, you can label the last points of your series. You can do this instead of a legend and, in many cases, it can make your charts easier to read, as your viewer’s eye doesn’t need to scan back and forth between the series lines and the legend. Thanks Ben – very handy. Just wondering how you get managed to have the annotation as callouts (i.e. with little lines linking to data point)? When you add data labels, you specify them as Custom under the Type option. 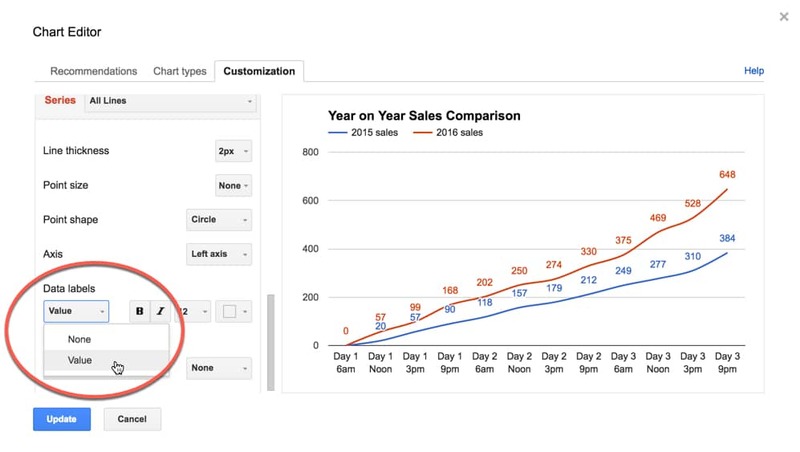 How do you remove the “Annotated….” column name from the legend (as in your ‘Year on Year Sales Comparison’ chart)? Does this work for data organized in rows? Thank you, This is exactly what i’m trying to do. Unfortunately, any form of character won’t show on the charts. Numbers and only numbers works fine. I just realise that numbers won’t show unless there is more boxes with numbers than boxes with other character. Do you know why ? Really helpful, thank you very much! Hi – this is really helpful, thank you! When I add the data label under series I only get two options: ‘Value’ and ‘None’. There’s no ‘Custom’ option – did that option appear for you automatically? Or did you configure it? I get this same issue. I think something must’ve change recently within Google Sheets. Thanks for your comment, Michael! Have updated the article to reflect this. 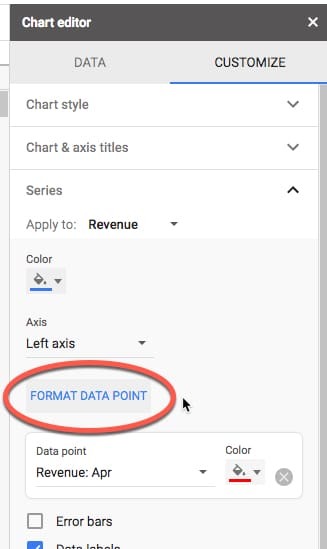 I’m attempting to do this, however ‘Format Data Point’ isn’t even an option appearing for me that I can select, within google sheets. I must be doing something wrong here. I’ve selected the line specifically, tried it in various browsers, but nothing. 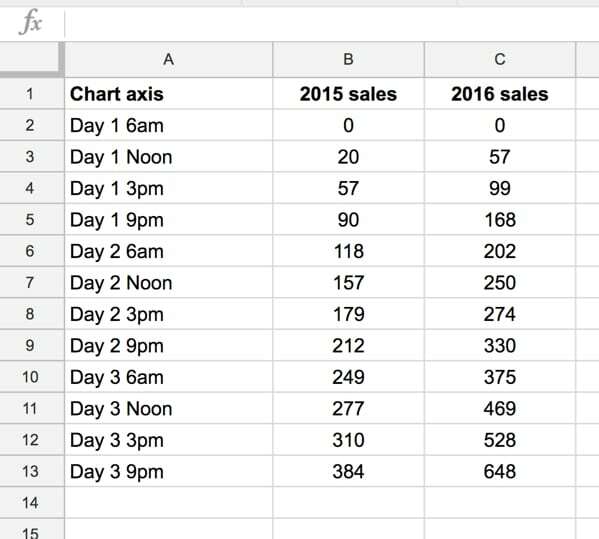 Do you know if something changed within Google Sheets by chance? Can you see “FORMAT DATA POINT” in the Chart Editor sidebar, under the Series menu? Are you based in the US or elsewhere in the world? My guess is that if you can’t see it at all, then it hasn’t rolled out to everyone yet. Hopefully you’ll get it soon!